I spent most of today on the couch nursing my cold/flu/general ickiness, and opted to watch Garfield: The Movie for the first time. The plot seems loosely based off the 1982 animated special Here Comes Garfield with the notable differences of being A) considerably longer, and B) considerably less funny. Part of the problem was the length. It was, effectively, a half-hour plot stretched out to 90 minutes. So you end up with things like an extended scene of Garfield and Odie dancing, and an out-of-place musical number in the middle of the movie. A lot of the gags were clearly contrivances to pad the movie out, and weren't terribly effective. Problem number two was in the effects. Or, rather, the conscious act of avoiding them if possible. Garfield himself wasn't animated particularly well and didn't seem to really interact with his environment so much as walk on top of it. And there were a few scenes where they opted for putting the character in a box, which then got pulled by a string, rather than animate the feline. If that were made in the early 1990s, I could maybe understand, but this was a 2004, post-Jurassic Park film. The movie felt very much like Garfield was dropped in around everyone else. The love story between Jon and Liz was terribly forced and wholly unnecessary. Liz contributed absolutely zero to helping Jon find Garfield. (Not that Jon did that much either, but he was at least able to drive Garfield and Odie home from the train station.) 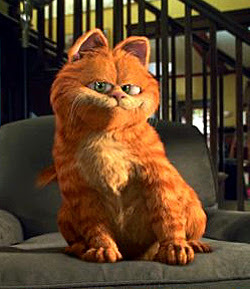 The movie's title was Garfield; it should be about Garfield, not Garfield's owner. Not a movie worth seeing, even if you just catch it on cable. The day wasn't a total waste, though, as I was able to get through half of Bryan Talbot's Alice in Sunderland between naps. Brilliant work, so far; I'll post a more complete review once I finish it. I got Alice in Sunderland for Christmas. I don't know if I consider it a truly Great work, but it's definitely Very Good. I felt that it sort of dragged a little, in places, and the whole thing was a bit loose. An impressive and entertaining book, nonetheless. I just found some of the incidental bits (Sid's repeated disrupting of the proceedings, e.g.) more memorable than the main theme.